See Lyric’s SCHEDULE to find out where she is teaching next. Can’t choose which surface design technique you want most to learn? Try taste of each? 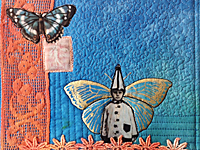 Make a small art quilt or book cover while playing with paint, foil, photo-transfer, thermofax screens, and stamp carving, and beading. 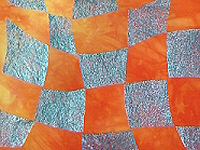 If you’ve looked with hidden longing over an imaginary wall to the world of art quilts but don’t know where to start, this is the class for you.Lyric will gently guide you through simple and concrete design exercises designed to help you create ideas for original abstract quilts. Doodles will be scribbled, eyes and minds will be opened, fun will be had. Learn the basics of beading on fabric. 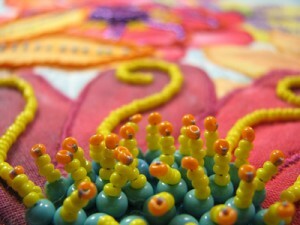 Easily add beads of all shapes and sizes to your quilts and wearable art after you are done quilting. Here’s the prize: no knots or mess on the back! 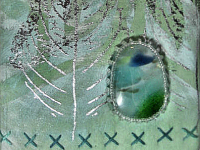 Learn to embellish in a way that adds to the overall design instead of looking like an afterthought. 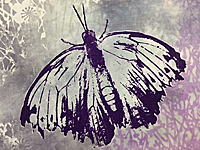 Come spend a delightful day playing with both foil and photo transfer. 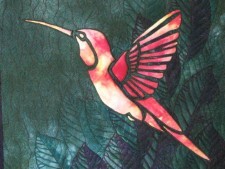 Leave with some little winged friends, ready to quilt into lovely postcards or art quilts. All you need is a pair of scissors, your self, and a sense of adventure! 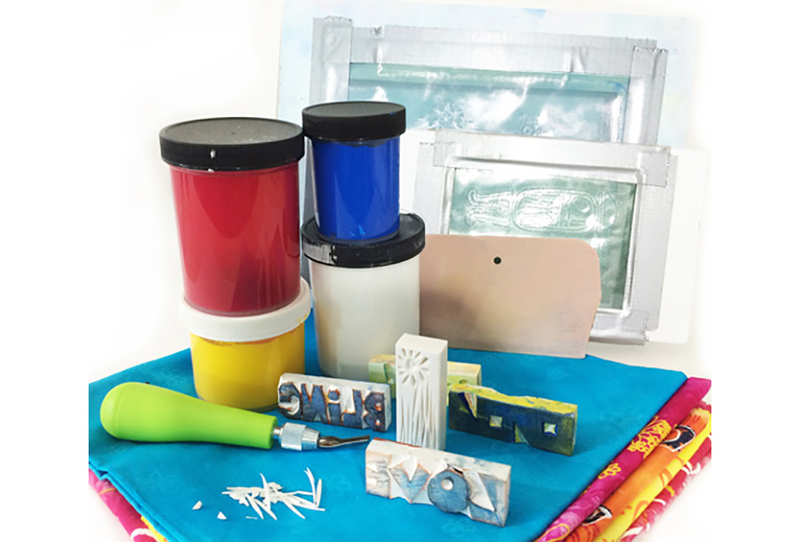 Stamp Carving, Stencils, Shiva paint Sticks, Screen Printing! Play like a kindergardener as Lyric leads you through different ways to apply paint to fabric. Focus on technique rather than projects as you create a sample book for future reference. 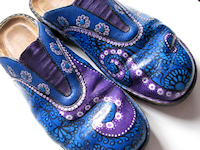 Turn a pair of leather or cloth shoes into a wearable work of art!Give new life to your favorite old pair of shoes by turning them into amazing piece of walkable art. Use textile paint, sharpies, and paint pens to create your own one-of-a-kind fancy footwear that will make your toes want to dance! Ready for some fast and frenetic fun with fabric? Join IAPQ 2011 Teacher of the Year, Lyric Kinard for a few fabulous hours playing design games that will lead to the creation of at least three fabric postcards. 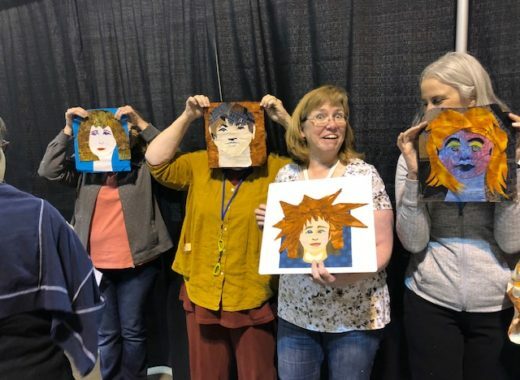 Come ready to make new friends, laugh, share, and make some ART!This class is a perfect game night event and can be easily scaled up for large crowds. 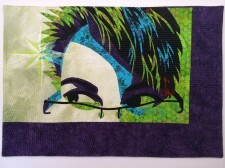 Both traditional and art quilters will gain valuable skills through this guided critique session. Come enjoy a day of constructive and creative learning as we explore ways to analyze artwork. 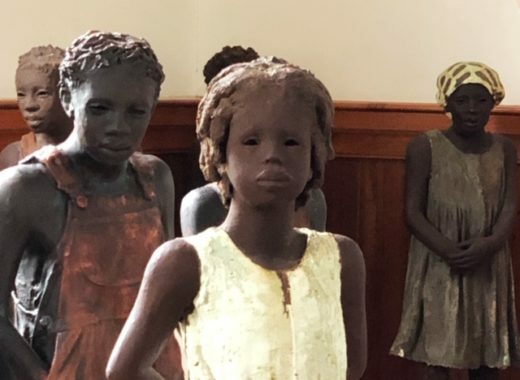 We will discover techniques that allow us to objectively evaluate art and learn which questions will help solve design issues. Lyric will help you critique your own work in an emotionally safe, positive, informative, and supportive way. Once you learn these methods for displaying small textiles your small scale art will never be mistaken for a potholder again! 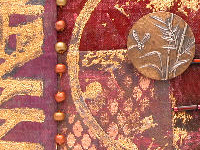 Come create a small fabric collage and learn a few stitching and beading techniques.While you mat and frame your artwork, Lyric will demonstrate a number of different framing and mounting possibilities suitable for any textile treasure you create. Ever wanted to go back to kindergarten just so you could spend a day making wonderfully creative messes? 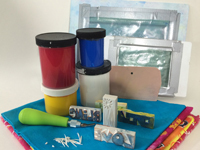 Then come learn different methods of paint application including: mono printing, stamping, stenciling, and painting with a brush. We will discuss the properties of various fabric paints and even play around a bit with thermofax screen printing. 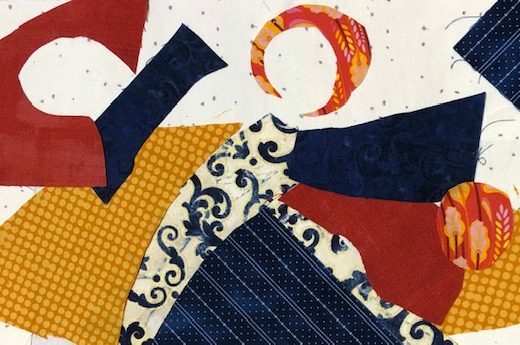 Make a lovely art-quilt while learning this low-tech method for transferring photocopies onto fabric. Lyric will demonstrate and compare various ink-jet products so that you know what your high-tech options entail. 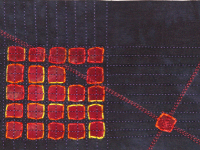 Students will practice transferring photocopies onto fabric two different ways using citra-solv and transfer paper. Painlessly create beautiful designs with intricate detail, perfect for wearables, blocks, borders or accents. Long flowing, curly borders or pictures with the sharpest points and thinnest lines imaginable are possible with this easy method using fusible web. Combine fabrics such as silk and wool for wearables or stick to your tried and true quilting cottons.Give your design that extra punch with the added dimension of trapunto… without all the slitting and stuffing! Are you enchanted by shine and entranced by sparkle? 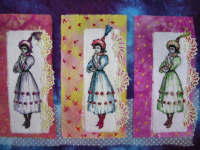 Come learn how to add some glittering wonder to your fabric then try some mystery too. 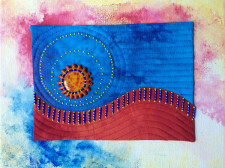 Discover the fun of fusible paint and it’s myriad possibilities.Students will learn various methods of adding shine to fabric including, foil applied with wonder-under, glue, or bonding powder. Students will learn how to apply paint to wonder-under and experiment with its uses. Click here for information on how to hire Lyric to come teach your group!